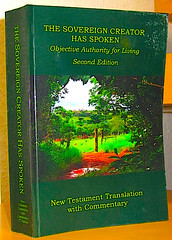 Contents: New Testament in the traditional order. – Table of Contents • Foreword • Acknowledgement. – Appendix (42 topics). Softcover large octavo, adhesive binding; 625 & (3) pp. 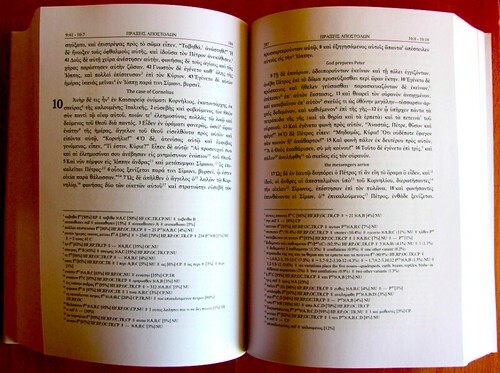 Scripture text in single column paragraph–wise set with headings; copious footnotes incl. cross references; therein lots of remarks to alternate readings, textual variants and their occurrences in various other Bible translations. »For some time Dr. Pickering has felt that among the many hundreds of Greek manuscripts known to exist today, surely God would have preserved the original wording. 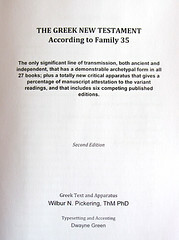 After years of searching and comparing Greek NT manuscripts, he has concluded that God used a certain line of transmission to preserve that wording. That line is by far the largest and most cohesive of all manuscript groups, or families. 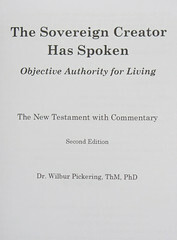 It is distinguished from all other groups by the high level of care with which it was copied (Dr. Pickering holds copies of perfect manuscripts for 22 of the 27 books). That archetypal form has empirically, objectively identified by a wide comparison of family representatives, and is indeed error free. 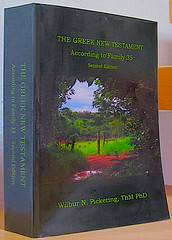 As he expected, this error-free text is not seriously different from some of the other “good“ Greek texts. Nevertheless he has done an English translation based on it.« The presented text includes some questionable readings as e. g. the longer Mark–ending (16:9–20) and that of the "Dirty Deal" (John 7:53 – 8:11).